NARRATIVE: Yesterday, January 13, 2010 the Spokane Fire Department responded at approximately 7:15 PM to 4110 North Cedar. The first crew on-scene reported light smoke showing from the front of the 1-1/2-story, wood framed house and they could hear the home's smoke detectors sounding. The fire crews forced the front door and aggressively attacked the fire from the front of the structure while additional fire crews completed search and rescue, ventilation and salvage and overhaul. The fire was brought under control within 15 minutes and there were no reported injuries to the occupants. One firefighter received a laceration to his hand and was sent to the hospital for treatment. Six fire companies with 22 firefighters responded to this fire and were on scene for approximately 2.5 hours. The Spokane Fire Department would like to take this opportunity to state the importance of having properly working smoke detectors through out your home. This fire was detected in its early stage by the next door neighbors who heard the smokes detectors activating within the house and they called 911 to report the fire. NARRATIVE: On 01/09/2010 at 1409 hours, the Spokane Fire Department responded 3 engines, 3 ladders, 1 pumper-ladder, and 2 battalion chiefs to a reported structure fire at 1712 W Nora Ave. First arriving company, SE3, reported heavy smoke coming from a 2 story residential structure. The first arriving ladder company was assigned to search the structure for occupants while other companies began a coordinated attack on the fire, which was located on the first floor and the basement. The basement location presented a challenge due to the fact there was no access for fire attack companies or windows to remove smoke. Companies had to manually create openings to expose and extinguish the fire. There were no injuries to civilians and one firefighter received a minor laceration to his hand. 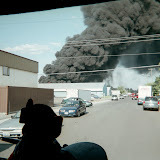 PROBABLE CAUSE: This fire is under investigation by the Spokane Fire Department Special Investigative Unit. DAMAGE EXTENT: Heat damage was confined to the basement and the first floor with smoke damage throughout the rest of the structure. NARRATIVE: On 01/09/2010 at 1110 hours, the Spokane Fire Department responded 3 engines, 2 ladders, 1 pumper-ladder, and 2 battalion chiefs to a reported structure fire at 2311 N Stevens. First arriving SE3 reported smoke coming from the structure. After ensuring all occupants were out, companies began a coordinated attack on the fire which was located in the basement. Basement fires present a unique challenge to firefighters due to the fact they can be very hard to access, difficult to ventilate, and have the potential to extend vertically throughout the structure. Companies had to remove a large portion of the first floor to finally expose and extinguish the fire. PROBABLE CAUSE: The Spokane Fire Department Special Investigative Unit determined that the fire was caused by a space heater which was placed in a crawl space under the first floor to keep water pipes from freezing. The heater ignited wood framing under the floor. DAMAGE EXTENT: Heat damage was confined to the basement and first floor with smoke damage throughout the rest of the structure.